Please put new questions at the top, after the TOC. 19x19 What should white do? What is the status of this group?
! SL pages covering these invasions? Note: If Quick Questions isn t the place to ask this, please notify me!
! Value of ko under Ing scoring? bluemark: In ING scoring, dame points count as one point. So I'm not sure if what we usually call "1/2 point ko" count more or less than a dame. Any ideas? The main exceptions concern the counting of points in eyes in seki. In general area scoring counts them, territory scoring does not. What is the UGI format? Is it identical to UGF as on Jan's site http://gobase.org/online/sgf2misc/?mode=ugf? Gobase transforms it to SGF, but strips it of all the commentary.
! Combatting low animal cunning? What should be done when an opponent drops an invading stone into every extension you make as soon as you make it? The pros don't play this way... why not?
! When to play lightly? Obviously there are times when one does not play lightly. For example the reply to a san-san invasion is not very light. So when do you play lightly? Maybe more to the point, when is light play not necessary.
! When to play thickly? Almost a reverse question to the previous one. ( Though thick and light are not opposites, there is generally a correlation between light and thin not thick? : and between; heavy ( not light ) and thick. So under what circumstances thick play is not necessary?
! Korean player record page? Calvin Can someone give me an idea of what this Korean player record listing means? mre 4k? Can anyone recommend any resources for an English speaker who wants to play and learn Go in Beijing? I will be there from 9/1/2005 - 9/10/2005 and am looking for some recommendations on how to make the most out of my stay, with respect to Go. Araldo's home page has his email address and talks about his go trip to China, including Beijing, in 2004. He might be able to give you some help.
! Tengen in 3-stone game? Q:I asked this of a dan on KGS, however the language barrier meant that he could not understand precisely what I get at. Q:How do you set it up so that only sections are edited at a time instead of whole pages?
! How long to shodan? Q. Calvin: When estimating the score during a face-to-face game, how do you guys keep track of captured stones if there are a lot? You may be able to count your bowl's lid, but what if your opponent has a pile and you don't feel like reaching over to rifle through it? Do you keep a mental tally of the captures? In some books, it looks like pros count a capture when they count the territory it was captured in, because they remember the capture (or can easily deduce it from the shape.) Do most amateurs also do that? Hikaru79: Well, remember, only the *difference* between the number of captures is important. Generally it's enough to know "I've captured three stones, he's killed that group of five I had earlier, so +2 for him whenever I count score." Rarely are there so many stones that it's hard to keep track of who has more.
! Greatest number of identical moves? argybarg? : I found myself wondering today: What is the greatest number of moves into a game that two different professional games have been identical? In other words, game A and game B unfolded identically until, say, move 8. If I had to guess, I would say it would have to be 12, but perhaps someone with a very sophisticated pattern search could find out. OTF: 19x19 What should white do? Play at a and aim to make black overconcentrated with respect to ? DJ: Sorry, I can't remember: can you make (in the text) a link to a heading in the same page? Apart from footnotes, I mean. Mef: I'd imagine there's some way to do it, since all the TOC's can. Fox: Hi Chris thanks for the explanation, oh and the speedy response. Jion: Any tips on getting back into GO after almost a year of inactivity? My mind just doesn't work anymore . .
Bob McGuigan: I don't know how far you had gotten in GO when you stopped but you could try refreshing the rules to start, then work through some basic problems, like those in ''Graded Go Problems for Beginners''. If there is a go club near you find some one to play with. Jion: Good point, I forgot about that . . I was ~10kyu when I stopped, and am trying problems, but when playing games I feel like a 20kyu. If anyone else has any tips, please post them. Christian: How can I add a link to a .png file without showing the entire adress? I don't want it to be inlined. See Text Formatting Rules for more info. Christian: That would inline the picture, and I don't want that..
unkx80: Currently no way to do that. Arno, a feature request, please. Thanks. Christian: I'll just create a page for each picture for now. AdamMarquis: I recently picked up Bozulich's 501 Opening Problems. One of the things that I don't quite get yet is that many of the problem's solution's involve attacking a 2 space extension by denying it a checking extension. I don't really see the followup to such an attack, so I figured I'd ask here. What should White do next, assuming a local response. What can Black do after tenuki? Should this have been a Big Question Mark? Why don't you post a full board position as a BQM? AdamMarquis That's a lot of 'a's. Posted as BQM205. I've got a bonus question: looking at the pages for several go books, I don't see a lot of reviews/discussion. Is this discouraged, or is there somewhere I'm not looking that has such material? OTF: What is the status of this group? nachtrabe: Not sure if this is the right place to ask this, but here goes. This position came up in one of my games recently along with a discussion on whether it was alive or dead after the game ended. Japanese rules. It makes me think of a bent-four-in-a-corner, but I am unclear on how to handle such, having never encountered one as such. Torabisu- That's Easy, It's Dead!
! Is it common for people to share IGS accounts in Japan? I've noticed wildly inconsistent levels of play playing against even the same player on IGS, and this frequently occurs with players with a "panda@.jp" address. I didn't realize it was possible to have an anonymous e-mail address on IGS, so I was wondering if there are shared guest accounts in libraries or if people share their accounts with friends or relatives. I played a player today who (if you believe the statistics) has been playing 12 games a day for 4.5 years and is still 18k*, though the initial rank is 2k. So I find it unlikely that a single person can be using that account. ThaddeusOlczyk: Let me answer this on several levels. One reason is that one person on KGS has accused another person of bringing in ringers. He claims that an admnistrator has confirmed this. I find the accusers claim that the persons style is different between games quite plausible, especially since both are high ranking dans. At such levels style are a distinctive thing. On the other hand the claim that an administrator has confirmed this accusation is not plausible. It is possible for an administrator to confirm that the presence of a ringer ( especially when it is done clumsily ), but it is not very likely. There is no mechanism that can raise a red flag for an administrator to suspect a ringer. For an an administrator to find a ringer, the first thing that he has do is suspect a ringer. So that is highly unlikely. Second, once he does suspect he would have to do some very complex detective work. For a ringer to hide his tracks, all he would have to do is log off ( his ISP ) every time he plays a game ( if he has a dynamic IP ). Now the general question, can a person use a ringer. The answer is yes. All you need to log in is a name and a password. Anyone who has them can play from that account. Though, since accounts are free, I don't see why people would do this unless they have some sinister purpose.
! A definition of "aiming"?
! Moyo Go Studio, for kyu level player's analysis? AdamMarquis: I've been looking at the preview information on Moyo Go Studio and have been intrigued by its analysis functionality. My worry, however, is that as a kyu player my shape and joseki knowledge is so bad that I wouldn't be getting local pattern matches to a pro database. Has anyone had hands on with a pre-release version, or any other info on how well it works for SDK games? Who or what is that dude with the pie-shaped body in the top left of all the pages here supposed to be ?
" Images of Stones are (C) Andreas Fecke and used by permission. Visit his site at ext http://stud.upb.de/~q9bettina/ferdi/ " - from about.
! Good Shapes to Run With What are good shapes to run with? What are good shapes to make eyes with in a small or awkward space?
! Cheap, Durable and Easily Stored Equipment byorgey: As explained in my blog, I'm starting a go club at my school, so I'm looking around for some equipment that is cheap, durable, and easily stored... does anyone have any suggestions? I was looking at these vinyl boards on Yutopian, but was having trouble finding any cheap (plastic) but full-sized stones. Any suggestions anyone has in terms of boards, stones, or bowls (Tupperware?) would be appreciated -- thanks!
! Computer Keeps Playing in Endgame jok? : Newbie question re: endgame. In games against MFOG, when I expect the computer to pass I have noticed a tendency to play inside my territory to force me to reinforce my wall. I lose a point of territory, but gain a prisoner. I don't think I have ever seen this kind of move played by a human player, and it strikes me as almost rude; as if the computer is expecting me to make a mistake. Is this a normal endgame move, or is it just a quirk in MFOG's style? Malweth: I haven't played vs. MFOG, however, this is a common technique, especially in handicap games, to test the opponent. I could also mention that MFOG probably doesn't yet know that it cannot live inside... in which case (for a human player) it can be good to at least try. As additional back-up, "First-kyu" (a novel about Korean go in the 1950s) mentions at one point that it's common for the losing player to make such a test before resigning. The other player will not respond incorrectly (at near-pro level), but there's always a chance; it also makes a good resign spot. Malweth: I think we had different interpretations of the question, since your final statement is in essence what I wrote. Just making forcing moves because you can is usually bad unless there really is a killing move. I thought the original question meant MFOG was making invasions that couldn't work, not zero point forcing moves. Making an invasion that probably can't work seems ok to me as it relys on the difference in skill between two players, even if a mistake must be made for it to work. I can't count the number of times I've played something but my teacher (or other stronger player) showed me why it shouldn't have worked. kokiri - maybe but given the question states when I expect the computer to pass i still think that any invasion at that point (i.e. just before the dame) is either too late or doesn't work - or someone has just failed to defend where they need to; any way you look at it, it's a sign of bad play by one or both sides; i guess the solution is just to play better - easier to say than to do. Malweth - and similarly, I interpreted "force me to reinforce my wall" as an invasion indicating a peep. In either case, a legal move can never fully be "rude." Rudeness depends on an understanding of convention and an acceptance of such conventions. It used to be considered bad form to play first move at tengen but interesting games can result. A beginner (as most of us can still be called) should play everywhere he or she thinks is possible. If there's a wide open space, try invading it. If you think you see a tesuji, try it out. Even useless ataris make sense when played at the 20-30 kyu level. just review the game after it fails (or even if it works). Read everything out (on a board, in SGF, or in your head if you can) and see what would have worked and what definitely wouldn't. In the end, this is how you can "just play better." jok? : Thanks for the replies! These moves are AFAICT zero point forcing moves, with no chance of success. All they do is force me to add a stone inside my own territory. Personally, I would not consider such a move against a human opponent; it would feel unspeakably cheap, as its only chance of success would be a total blunder on the part of my opponent. I suppose the reason MFOG plays these moves is that it can't really tell if the required response is blindingly obvious to a human opponent. Coconuts: I wonder if anyone could be so kind to help me out as white against the Chinese Fuseki. I personally don't like playing this but I have faced it several times, and each time my answer has been lacking. The slide at a seems far too passive, and the invasion at b leaves B with exactly what he wanted--a wall facing strength below. b seems to be better for white than invading after a pincer, but is it good enough? Sorry if this is too involved, maybe I should move it to BQM. Tderz This is the Chinese Fuseki. Where is the black 3-4 point supposed to be? left-down ? or right-top? Is ist Chinese-low or -high? Chris Hayashida: Probably better to draw it out and move it to a BQM. This isn't a "quick" question. Assuming that the Chinese opening goes down the left side of the board, just sliding is probably fine. Black doesn't have firm control of the left side of the board, so you might be able to exploit the weaknesses of his upper left and invade on the left side as well. Put up the actual game position and we'll be able to help more. byorgey: If you are slightly ahead in the late endgame, but then your opponent plays an unforseen tesuji, catching a few stones and swinging the game to him by a few points, is it more polite to resign (since you have obviously lost), or to play out the last few remaining moves (since the game is so close to being done)? And no, this is not a hypothetical question... (= Obviously I would rather resign since playing the last few moves would just be painful. Any thoughts? IanDavis : I think strength is a major factor in this. I'm scraping 3kyu and can't count for toffee, if somebody chided me for not resigning I would just be amused. byorgey: Well, I'm nowhere near that strong, but at least in the endgame I'm trying to make a habit of counting. (I'm still not exactly sure HOW to count in the middle game...) At any rate, I ended up resigning, since it was clear I had lost and there wasn't much more to be learned from the game. But I'd still love to hear other comments and opinions, if there are any. where I can find the tutorial of mathematical go for end game? If any one can help me . pleease email me to my email address alan_ca2001@hotmail.com. Thank you very much. Mef: Are you referring to things like Combinatorial Game Theory and Miai Counting? Question from WillerZ: What is an anti-seki? The term is used on Basic Ko Anomalies. Bill: De nada. :-) Interesting question. How do I make a page Alias? And are the hit counts of the Aliases combined? Arno: see HowAliasesWork. Hit counts are combined, but the initial count for the alias page (i.e. if the page already existed and got some hits) is not added to the main page when the page is made an alias. How can I leave a message to an librarian? And can he/she change a rooms name? unkx80: If you want to change the name of a page, please make a request in page name change requests. If you have a general message (to anyone, including librarians), then the message board is an appopriate place. By the way, I renamed one of the pages you created to become a subpage of hikaru fire. albacore: I was looking at the smallest group with two eyes page which raised a question in my mind, but I didn't want to edit that page. When your opponent has a group that they can easily connect to make 2 eyes, should you play in the group to force them to do it? (This is discussed in connection with the final side group on the page mentioned.) It seems to me it would make sense to do this, as each stone your opponent plays in their own territory to connect the group reduces their score by 1. Am I missing something? Bill: Do you mean this group? 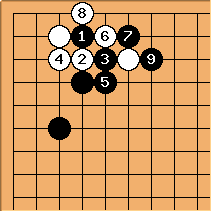 Suppose that White plays at a, forcing Black to respond. Black still has 4 points: 3 points of territory plus 1 dead White stone. The score remains the same. albacore: Many thanks for taking the trouble to answer. I can see only 2 points of territory, plus the 1 dead stone. Are you counting black at 2 as territory? The software I use only counts the empty points and dead enemy stones, and my understanding was this was the Japanese way of scoring. Hence the point of my question. Paul Clarke: At the end of the game Black would remove from the board, as it has no way to avoid being captured. That leaves Black with three empty points plus one point for the prisoner. albacore: I had not understood that aspect of the counting, and I guess I misunderstood how my software counts territory and prisoners, too. Many thanks for the clarifications in your answers. jfc: cough area counting cough. Question about the pro stat boxes. When you look at professional player's statistics, the graph has the number of games played, scoring, and average. Any insight as to what these mean or how to interpret the trends. Thanks! Niklaus: I assume you are talking about the statistics on http://gobase.org. Number of games is simply how many games the pro has played. Scoring shows how many of those he has won (percentage). Average is the scoring percentage averaged over the years. So the main thing to be read on that graph is how successful a pro has been over the years. By the way, I think these statistics only account for the games that are in gobase's collection. I am having lots of trouble getting SGF files to open within both my browsers, Mozilla and IE6. I looked at the SGF help files but couldnt' figure out how to handle MIME types, etc. I don't have an SGF player, but any suggestions would be appreciated. Bob McGuigan: I am in no way an expert, but I think SGF files are simply text files that happen to be written in a special format. SGF readers are programs that take this text file and turn it into a diagram. There are many SGF readers available, some of them are free downloads and also function as clients for some go servers. See SGF File and Go Editing Programs. Dieter: Let's call it three star points, contact invasion. Bob McGuigan: Are you thinking of A Cautionary Tale?? Zarlan: No I think it is the one where the father had played Go, so good that he only had to play a few times to allow their family to have a lot of money and status, but after his death the son is forced to play to get money. He doesn't know much to begin with but his mother and sister fix a board of cloth and pebbles that they play with although women aren't allowed to play Go and... anyway where is that story? puripuri: Hmm looks like I remembered a little wrong... Zarlan's description sounds quite correct now that I think about it in more detail... Skipping through A Cautionary Tale?, it seems like another story well worth reading. Thanks for that tip too. 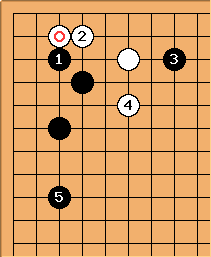 Q: Fwiffo: Online, when playing with Japanese rules, most players rarely fill in dame (with the exception of points that force the opponent to fill in part of their own territory) at the end because it's not worth any points. My understanding is that dame points are worth points when using area scoring (such as in Chinese rules), and should be filled. I've noticed people sometimes neglect to do this when playing my robot (which is set for Chinese scoring for technical reasons) and lose points as they pass while the robot fills. 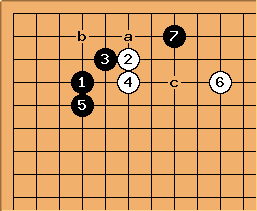 Bill: The idea of pass stones in the AGA rules derives from an article I wrote for the American Go Journal in the '70s about Chinese rules. In the article I call them bookkeeping stones. 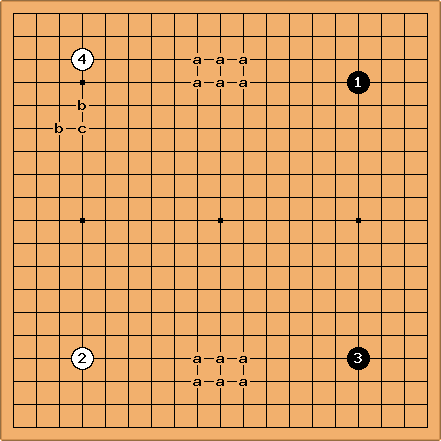 Their purpose was to allow the use of territory counting with the Chinese rules, since most American go players were used to that style of counting. (I was not the first to have that idea, though.) So, yes, you typically need to fill the Japanese dame under AGA rules. Q: bojo: Is master editing out short summary of change possible? There is/was a blatantly racist remark typed up in regards to AtomicBombGame, but I am unsure if it's possible to revert that out. A: Arno: no it is not possible. Currently only I can do that. If the problem reccurs often enough, librarians will get the ability too. I have deleted the abusive summary. Q: Hikaru79: I am wondering whether it is allowed to take SL's template files (browse.html, etc), modify them, and use them for your own Wiki--I'm not sure if "Open-Source" extends that far. There were no attempts made to somehow deny access to these files (I easily found them), so I assume that it's OK to take them and play with them a little; But I am asking just to be sure :) Is it OK to take SL's template, modify it to suit one's purpose, and use it on a non-commercial Wiki? (I'm planning on making a Chess or Shogi Wiki with a similar layout to SL) Thank you! Eratos You can certainly download the MediaWiki software that SL is (AFAIK) based on, and other Wikis like WikiPedia, WikiBooks etc. I'm not so sure about things like SL's unique board diagramming and SGF creating parts though. Morten: Hikaru79, I'd suggest that you drop Arno and myself an email with what you would like to do and we will get back to you. I'm not exactly sure how to follow this up. Usually I just let it go, approach from the other side later, and eventually close him in. However, I'm curious if there is a more efficient way to deal with it. A: unkx80: Please see 4-4 point low approach, low knight's move block and BQM 146. Q: Jion? : I have NEVER played a 13x13 game before. Do any high kyu players or higher think it helps your game? I have played many 9x9 games using igowin, and I think it has helped my fighting and endgame. I think a 13x13 would be far more territorial than 19x19 . . comments or thoughts? A: unkx80: As the board size increases, the game will get less and less territorial. Q: Jion? : Hi, this is my first time posting here, so apologies if I inadvertently mess something up. I was wondering if a slotted board is a board that is composed of two pieces, and fits together with slots, or is it a folding board that has slots on the side so it is more secure? Any recommendations on whether to get a slotted or folding board? Also, any major difference in Agathis or Katsura wood? I think I might get a folding board, but wanted to know what other people think first. TIA. A: HansWalthaus? : A slotted board is a board that has pieces that are slotted together. A folding board that has slots on the side is just a folding board with some nice bodywork. I think slotted boards are better if you're playing on a slightly oneven surface. And slotting the board is cooler than folding one open :) No comment on the wood types. Hope it helps. A2: mdh Note in some places, Katsura is becoming rare and hard to find. My local shop has a sign up saying it is now a protected species and they will not be selling any more Katsura boards. A3: JohnAspinall The problem with folding boards is they eventually warp over time. I have a cheap folding board where one of the halves has warped enough to put a ridge right down the middle line of the board. I'm considering cutting the felt backing, straightening the warp out and routing alignment slots to turn it into a slotted board. I'll let you know how it goes. Alex Weldon: If you're in a defensive position, go for the White stones. 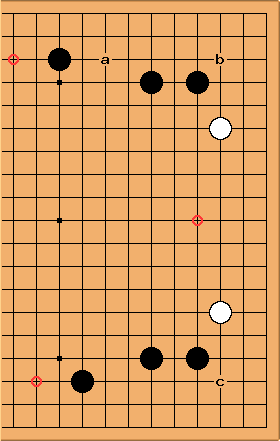 The Black position allows potential for a White tesuji (c.f. strike at the waist of the keima) to cut, if there are White stones nearby to help. Q: Neil: What shape is better connected of these two, white or black? White can try to save but then will be captured unless there are nearby white stones to help. 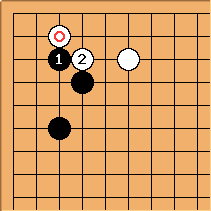 Q: ColJac: I see the word "Igo" used to describe go in a Japanese context. One would assume that this was the Japanese word for go, but more often one reads that "Go" is a Japanese word. And what am I to make of "GoGoIgo!"? Can someone explain the difference? A: "Go" means something like "game". "Igo" means something like "surrounding game". "Go Go Igo" is an example of both Japanese love for foreign words, "go" from English, and a popular word-doubling idiom. A: See the Etymology of Go. Q: What's the Korean equivalent of kenkyuusei and haya go? Q: How long do preliminary matches last in the Japanese Go scene? I mean title matches are given 8 hours or 7 or depending on the title. How about the qualifying games for these matches? And how about the Ooteai, how long were the games back then? A: Kisei, Meijin, and Honinbo preliminary matches give 5 hours per player with five 1-minute byo-yomi. 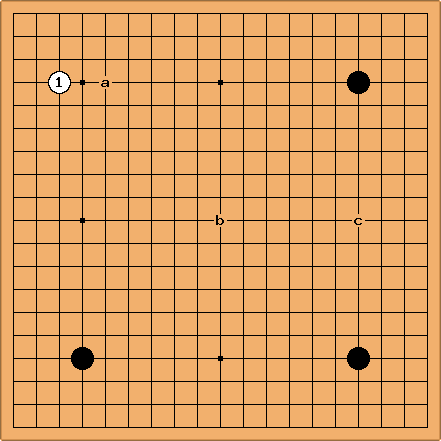 Q: Results of Go games are sometimes marked "B+R". Does that mean "Black won by resignation" or "Black resigned"? thanks in advance! Q: alter Pedro: do you play with or against your opponent? A: I'm still only playing against them, but I start to see playing with them is much more rewarding. A: Tamsin It's to avoid confusion between "i" and "j" in game records using algebraic notation (i.e., co-ordinates written in letters and numbers). - I thought it was because "I" could be confused with "l" or "1". HolIgor: They had some difficulties with spelling LATIN, hadn't they? If a is the (upper left) 3-4 point, I guess that makes b the 4-3 point. Does the order in which they are played change their names? on a 19x19 board should the point a be called the 16-3 point? 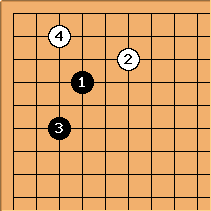 A: Confused: When used in the context of corner patterns like joseki, the expression '3-4 point' should be interpreted as 'point 3 lines from one border and 4 lines from another border'. There are 8 such points on a goban. Usually the first play in the sequence that isn't on a diagonal decides the direction of numbering. A: StormCrow: It depends on the person. Most people I know rarely record casual games. I generally record games I play in a tournament using a program on my Palm Pilot. If games are recorded on paper, they are generally marked up on a grid, rather than as a list of points played. A: Benjamin Geiger: See also HowToRecordAGame. Q: A stronger player in a 9x9 teaching game recently told me that I shouldn't "hit below the shoulder" but should "hit above the shoulder". I am familiar with the concept of a shoulder hit but why is above better than below? A: Stefan: turned this into BQM75. Q: Can somebody give me a good definition of the term "life basis"? One person told me that it is room to make an eye, another told me it is potential to make two eyes. It seems to be an important term to consider in settling groups. Perhaps someone could start a discussion page about it? A: Charles Matthews See base. A base for a group ought to be at least one eye, really; potential to make two eyes is 1.5 eyes, as we usually reckon it, and that's harder to have in fighting. Q: Is there a word (other than invasion) to describe dropping a stone lightly inside an over-expansive moyo when it has a chance of either achieving sabaki or escaping? I've heard it described in English as a "Paratrooper invasion". Q: Is there a word for a dragon that pokes its head through one of your walls, and runs amok reducing your territory? Q: In Chinese there is a term that translates as 'virtuous warrior's advance' Virtuous (de) means powerful in this context. Though this term describes the dynamic action, rather than the static formation. Morten: Can people who copy & paste existing questions from other pages to this page please take care that the questions are 'quick questions' and are not obsolete or old, or taken out of their context? A: Hikaru79: Never mind, I've solved my own problem. It can't be done the normal way, but if you make it an external link ( http://senseis.xmp.net/?random=1) then it'll work. I'd still be interested if there are other ways of doing this, though. Q: Help! I've wiped out my browser cookies in a fit of housecleaning, and I've forgotten my SL password. Can it be mailed to me? Q:Dan Argent: I need a place to download the java stuff to run KGS on my second computer (it was already on my first). The CGoban site gives a link to the sun systems site, but for the life of me, I can't find the spot to just download the apropriot JRE. can anyone help with a link to a free download and/or a walk through of how to get it installed? A: Yes, the page ( http://java.sun.com) is confusing for non-programmers. Try http://www.java.com and tell us if this worked; you should be able to use the Download link at the top right. A2: J2SE 1.4.2_02 downloads:. Take the offline installation JRE if you want to reuse it later. Walkthrough: start the installer. Press Next/OK. Done. Q2:Dan Argent: Ok thanks, I got the download. that was easier than I thought. But now CGoban 2 still says that it canot find the java runtime environment. what now? Dan Argent:I downloaded the wrong stuff. I solved it now thanks for those who helped, I am now using KGS on both of my computers. amadis: I was looking for the KGSEnglishChatRoom? page but had a hard time finding it. I think the reason is that somebody added a slash character "/" to the title, which caused unforeseen results. Are any non-alpha characters allowed in page titles? SikeElegy: Roughly how many official pros are there (in particular countries, or a combined total)? Charles Japan 400+, China 200-250, South Korea 200 and increasing now; Taiwan 20, North America 10-15; a few in Europe and probably one or two in Singapore and Hong Kong. SikeElegy: What's up with the Hao Mao Cup (Chinese City League Tournament)? It was my favorite tournament to follow, but when igo-kisen dropped it, I found myself completely unable to find any info about it, current or otherwise. SikeElegy: No one has anywhere they can point me? The last I've found/heard is the go4go.net news for April '04, in which they said the "Chinese City League A will start in the middle of the month" but I haven't found anything with results or any kind of further info (not even the teams). HolIgor: http://www.yigo.org/modules/freecontent/index.php?id=82 seems to contain the tournament table. Frarugby Thanks very much for all the help guys. Here's a bit of a follow-up question: Which Go server do you guys recommend for a relatively new player like me? Why do people choose some servers over others? any opinions? KGS: best user interface by far. great features for teaching. you can run the KGS client from a web browser. I play here exclusively these days. IGS: Many pros play here. better if you are really strong and have trouble finding opponents at your level. Pro games often simulcast on IGS. Q: Kiruwa: If anyone has answered this already, I apologize. But I'm curious what the japanese word to indicate that you are passing is.